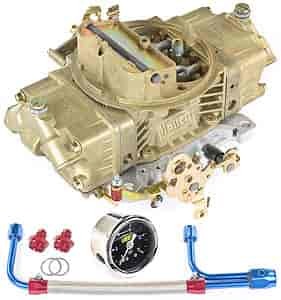 These Holley Classic Double Pumper 4-barrel carburetors sport the classic Holley "gold" Dichromate finish. They are available in a variety of CFM (Cubic Feet per Minute) sizes to meet the volumetric efficiency your engine requires and for many sizes you can choose from the carburetor by itself or two kit options: one with a braided fuel line or another with both a fuel line and JEGS liquid-filled fuel pressure gauge! Will this bolt straight on to my 383 stroker?